COLORADO SPRINGS, Colo. -- The U.S. Senior Open takes place this week at The Broadmoor (East Course), with Jim McGovern of White Beeches and amateur Ned Zachar of GlenArbor having made the field through qualifying at Suburban last month. Throughout the week, Zachar will share insight on his experience, authoring a player blog. Meanwhile, former PGA TOUR winner Jim McGovern is in a marquee group for Thursday and Friday, as he'll play alongside Hall of Fame pitcher John Smoltz and former Oakmont professional Bob Ford. Again with Ricky Touma from Burning Tree in DC and the crazy-long hitting David Carr of Marysville, CA. Labritz on the bag and a beautiful entourage in tow including my two favorites, JZ and JC. I hit the ball better generally but the missed shots were more penal. I hit every fairway and drove the ball great. But, it’s a second-shot course and unless the “play” had the perfect line and the perfect weight, then it was nearly always a bogey. Again, did not make any ten footers for par despite hitting a lot of very nice putts... Mountains. The double-double thing on 7-8 took some air out of the sails. In each case, I played the wrong club from a good position. Nonetheless, the fight moved on and hit some terrific shots on the last 10 holes. The low point of the day was the getting a shot clock warning when I might have been over by 5-10 seconds on 13, after already catching up to the group in front of us. There was a lot of math on that 482-yard hole. That usually bothers me, but this time it did not. I finished with an 81, which was far worse than I hit it, and a 159 total for 36 holes. I fought the whole way and had an absolute ball doing it. Gotta thank Rob for his amazing math because figuring out the distances with the elevation changes, altitude and wind was tricky and I had the best golf software engineer working for ME. My short game was very very good, even though some of the pitches didn’t turn into pars. The high point of the day came in front of the crowds again with a drilled drive on #1 and a stuffed 8-iron on the 170-yard 16th to two feet...it nearly went in but had a tap in 2. I was very happy with the way I drove the ball under the gun; every single fairway and most of them hit hard. The guys I played with were terrific--beyond good and they’ll be friends forever. Both of them had their sons on the bag, which was very special to watch, especially the Carrs who are a true golfing family. I think the USGA did a great job with the golf course and the setup; it was very very hard but they let the beauty of The Broadmoor and its instinctive mountain challenge create the great vibe for the field. No extra effort was needed. It is an amazing feeling to be between the ropes playing golf with people paying to watch ME play golf. It was UNBELIEVABLE. The support from the crowd was fantastic because they know who the amateurs are and they root for people who hit the ball like normal golfers. The crazy thing is I felt completely comfortable with the crowds and I hit the best shots with the most people around, so that just means I have to figure out a way to get back here (next year at Notre Dame — Kevin M). It was just an amazing experience. On the 15th hole (after a great drive and perfect 2nd shot that ended up in the bunker), I started thinking about how unfortunate it was that it was all going to end in about 45 minutes. I appreciate all the phenomenal notes and emails and texts I have gotten over the past week from friends and followers. It’s been overwhelming and hopefully I can take some good stuff out of this amazing experience. This is a pretty brief post because I am just beat after a day of hiking the Broadmoor East Golf Course. 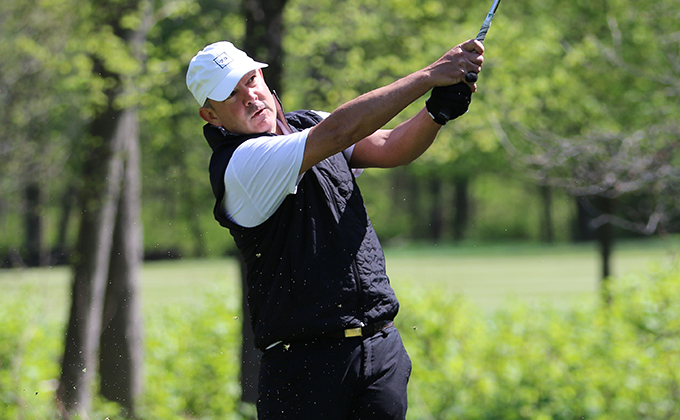 The opening round with David Carr (77; Marysville, CA) and Ricky Touma (80; from Burning Tree outside DC) was a treat. Both were perfect gentleman with their young sons David Jr. and Peyton, respectively, on their bags. I had an entourage and they came from many points including New York, Denver, Richmond, Chicago, Credit Suisse, and Aspen. The best was having my awesome family including spouse Janet, and daughters Sarah, Allie (and now Jane tonight) here for the festivities. The cheering squad was priceless. Coach Rob Labritz was on the bag -- someone who’d actually been through this type situation multiple multiple times – and who knew my game better than anyone and gave me a lot of confidence. I posted a 78. Not bad, not great. I managed the game pretty well without hitting it perfectly off the tee until the last hole crept up and bit me with a double bogey 7. Perfect drive and layup was followed a slightly chunky wedge from 85 yards which came back 35 yards. Crisp wedge to fifteen feet and good putt rolled out 10 feet. It was really the only diabolical hole location of the day but unfortunately was on my last. The short game was solid, and Rob gets the credit there as we have hit tons of wedges from everywhere. I seemed to have the best luck in front of the bigger the crowds. Nice birdie on the scenic 240-yard 12th, a 25 footer on 18 (my 9th) for another and a chip-in birdie on 3 (right by the clubhouse) from 15 feet, and all received some hearty cheers. I also had four or five 10-footers that did not quite fall, which could have really helped turn this into a terrific round. The USGA was careful with the set up (ex the 9th hole location) as I think they were trying to make sure that the course played reasonably following the difficulties at Shinnecock. On the other hand, they weren’t careful with the rough it all — usually a pitch-out situation. Leader Jerry Kelly shot 66, which is an amazing score on these greens, with four players right behind at 68 including the Mechanic, Miguel Angel Jimenenz and Rocco Mediate. I've been sticking with my nine-holes-a-day approach. I played the front on Tuesday with Robert McMillan, an alternate and formerly a professional at Turnberry in Scotland and Mark Walker who has Web.com status and now plays the Champions Tour, since he just turned 50. That guy hit the ball GREAT. Both now live in the Dallas area. Wednesday morning, I played the back nine with Jay Haas (three senior majors and a zillion tour wins) and Jeff Gallagher, a teaching professional from Las Vegas. Both are perfect gentleman, especially Jay and his caddie Billy Harmon — whose family needs no introduction. Billy was awesome. The course is starting to firm up as temperatures moved into the 90s the last two days. The USGA has given the players a heads up that they may be syringing the greens in the context of the high temperatures and arid humidity. Coach Labritz has my swing headed in the right direction, hitting all of the fairways and most of the greens on the easier front side. The back side this morning was more challenging since I did not drive the ball as well, but I made some nice up and downs to save par. Playing with Jay moved the heart rate needle to be sure. A very good practice session this evening might have worked those minor kinks out. Mountain putting continues to mystify me at times and it wasn’t just me as we all had our adventures figuring out the right lines against Cheyenne Mountain. The thrill yesterday was stuffing a 6-iron to 8 feet on the table-top 4th hole with a healthy crowd surrounding the 1st and 4th tee boxes. I missed the putt but there were plenty of oooo’s and aaahh’s. I've finished each day nicely -- making birdie on the relatively straightforward 9th on Tuesday and a good par on 18 today — a great way to wrap up each day. Game time Thursday is 2:36 pm MST off the 10th hole with David Carr of Marysville, CA and Ricky Touma of Olney, MD. Same group plays on Friday at 9:06 am off the 1st. I think most of the field will find the course very challenging. The rough remains pitch-out thick and the greens are very very sloped most of the time. Around the greens, you have to make very big flop shot swings to keep the clubhead speed up, even on 15-20 yard shots. On the other hand, the fairways are generous enough, especially on the 475+ yard par 4s which will really help the long, straight drivers. For me, par might be 72-73 but there are some holes where you can score. It will be interesting! Short post today because there is not that much new to report – except that the vibe was beginning to build yesterday at The Broadmoor as many of the Champions Tour regulars arrived from Madison, Wisc., following the American Family Insurance tourney. Scott McCarron won, with Jerry Kelly and Fred Couples close behind. The support from the Colorado Springs community is tremendous, as there were a lot of people out watching for a MONDAY practice round. Autographs were a new thing for me…the sweetest kids, thrilled with a signature from the Bedford, N.Y., amateur. Good stuff. I had a very good practice tune-up with Coach Labritz and am starting to hit it very solid. I played the final three holes of my 9-hole practice round with Jay Haas, Grant Waite (we competed against each other in college when he was a Sooner) and Jeff Wilson of Napa, California. They could not have been more gracious and I’ll play again with Jay on Wednesday morning, which will be a treat. I expect to stick with the 9 holes a day approach, along with solid work on the short game--mostly to preserve energy at the 6,350-foot altitude. It’s hard to do, mostly because you want to see the course as many times as possible — but I think energy factor will end up being the more important variable. Many many thanks for all the great replies. Be good and we’ll keep you up. I got my first look at the setup for the U.S. Senior Open at The Broadmoor in Colorado Springs on Sunday. I qualified for the event one month ago to the day at Suburban Golf Club in Union, N.J. I have been around the hoop in this qualifier over the years with 71-72-73s (Scarsdale, Upper Montclair, Garden City CC) but wasn’t making the multiple 10-15 footers that you need on those particular days. A 69 at Suburban with four 10-15 footers got me to a 3-for-2 playoff, which I fortunately go through on the second hole—and here I am! The Broadmoor East golf course is amazingly scenic set right against the mountains. Fairways are pretty generous, the rough is pitch-out deep and the course is very long despite the 6,350-foot altitude here. There are several par 4s at 475 yards or longer, especially on the back half of the course. The shorter par 4s are generally straight up the mountain. On the other hand, the ball definitely goes further than you are used to at this altitude, especially with well-hit irons. Also, you can run the ball up from the front on the longer holes. Not every green is surrounded by bunkers. The official yardage is 7,264 yards at a par of 70. I’ve hit the ball reasonably well and am getting the hang of mountain putting, but I will hopefully get sharper as the week moves on. The grandstands, TV towers, hospitality tents, and gallery ropes should aid with focus. The course is in perfect shape and I am told the greens will stay around 11 on the stimpmeter. Largely because the slope for many of the greens is quite severe coming off Cheyenne Mountain. Think NORAD, War Games and the WOPR. We’ll see on the green speeds. My tee time is 2:36 p.m. off the first tee on Thursday and 9:06 off the 10th tee on Friday morning. Wednesday, my nine-hole practice round will begin off the 10th at 9:00 a.m. The weather is supposed to heat up as the week goes on, moving into the upper-90s by Friday, which should help firm up the course following afternoon thundershowers on Sunday. A bit of speed on the fairways will help get the ball to run out, which I certainly could use. Coach Rob Labritz will be out today to help with the prep and GlenArbor’s Jason Cosentino will be on the bag for me. Both will be a huge help in creating the right atmosphere to succeed. The bottom line is that this whole Broadmoor adventure is a tremendous thrill—competing in one of the five Champions Tour “majors” with people I have been watching on television since I can remember and haven’t competed against since college. Hopefully my game this week can match the moment.